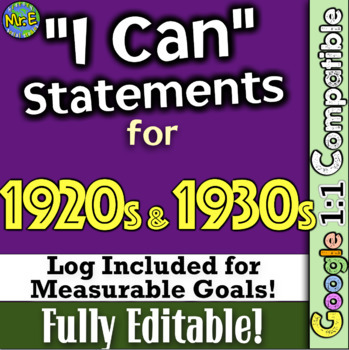 1920s and 1930s "I Can" Statements & Log: Measure Learning on the Roaring 20s! Roaring 20s, 1930s, Great Depression Bundle! 11 Fun Resources for the 20s & 30s! 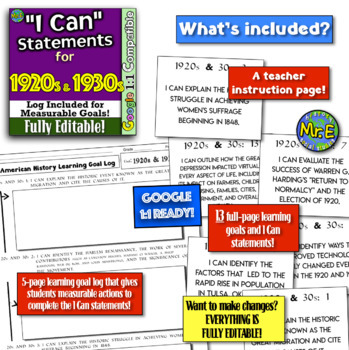 First, you receive 13 full "I Can" statements and Learning Goal posters for the Roaring 20s, 1930s, the Great Migration, Harlem Renaissance, Prohibition, Women's Suffrage, the Tulsa Race Riots, the Teapot Dome Scandal, the Great Depression, and much more! Second, the 13 measurable goals have been arranged into a 5-page student log format where students complete measurable actions to show their understanding. 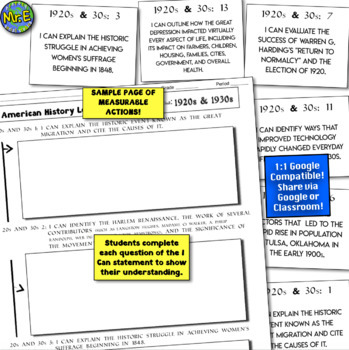 For example, the first "I Can" statement has students focus on the Great Migration, "'I Can' explain the historic event known as the Great Migration and cite the causes of it. ."
This activity guides student learning, holds students accountable, shows each child what they are responsible for knowing and doing, and helps keeps the focus of your classroom! An editable paper version is included along with a Google 1:1 version to allow students to type directly into the document!